I remember the opening of The Modern Pantry more for its timing than anything else, for it coincided with the announcement that Lehman Brothers had gone into bankruptcy. The popular press swooped on this fact, with most calling the opening ill-timed. A year on and thank goodness the restaurant is still here. The downstairs café area was boasting a full house on the night of our visit, although the upstairs dining room, nicely decked out in blue-grey walls, black tables and bleached wood floors, was only half full. Head chef is Kiwi Anna Hansen who previously worked with Peter Gordon at both The Sugar Club and Providores, the influences of which shows in the little fusion touches which dot her menu. We started with a baked bee pollen crusted ricotta, pear, sorrel, endive and lucques olive salad with a Manuka honey and lemon dressing and a quinoa lavosh (a flatbread) (£7.50). 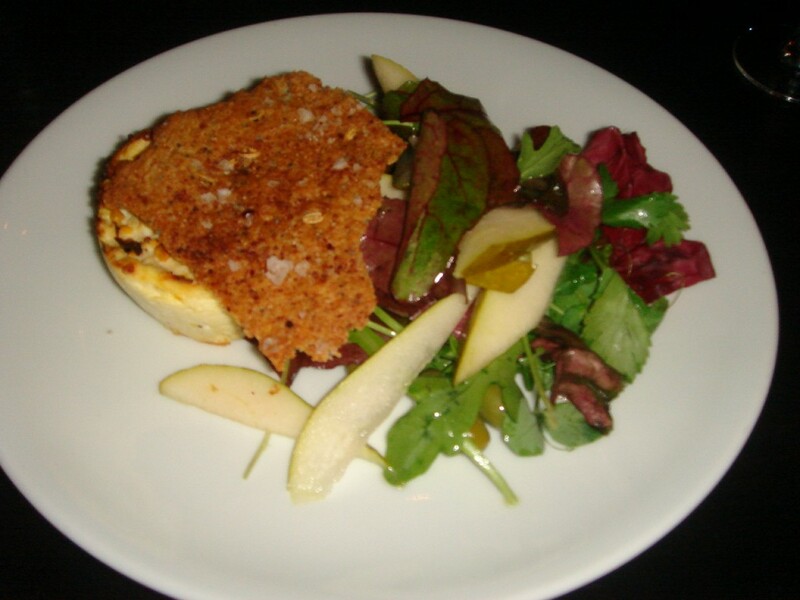 The baked ricotta, with just a hint of sweet honey, was delicious. Creamy and light, it did not overwhelm the palate by being too heavy or rich. It was slightly crunchy from the pollen and resembled a fluffy savoury cheesecake. The lavosh, crispy and light, was also very tasty. The salad was dull however. The pears were sweet and firm, but barely dressed, it was difficult to taste the honey or lemon in the dressing. It was also underseasoned. Despite this, the quality of the ricotta made this dish worthwhile. 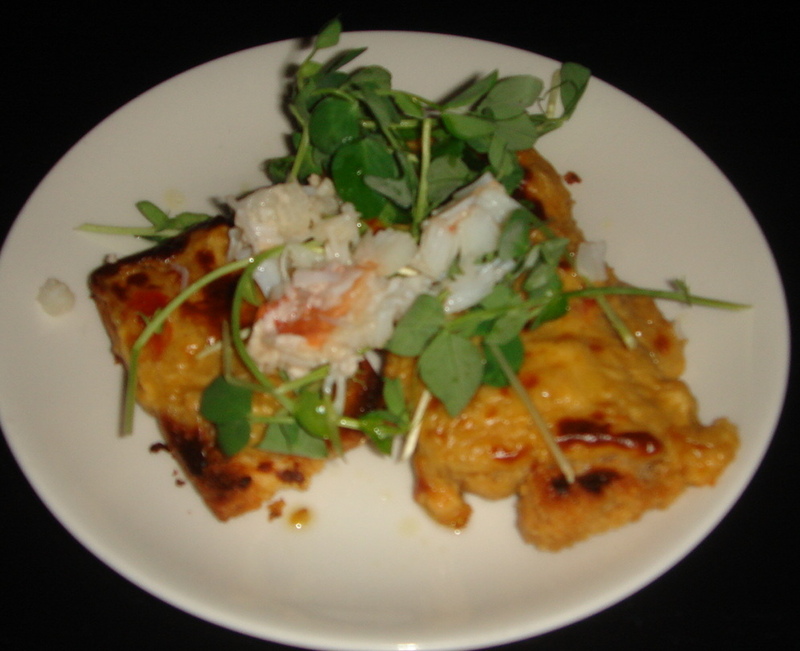 A second starter of crab rarebit (£6) was tasty. There was a reasonably good ratio of lovely sweet crab to cheese. The bread was crunchy on the outside and soft and doughy in the middle. The rarebit was served on a small bread plate, so visually it was a little underwhelming. More could have been done to elevate the presentation of this dish, eg, by using a larger plate and garnishing it with some salad. 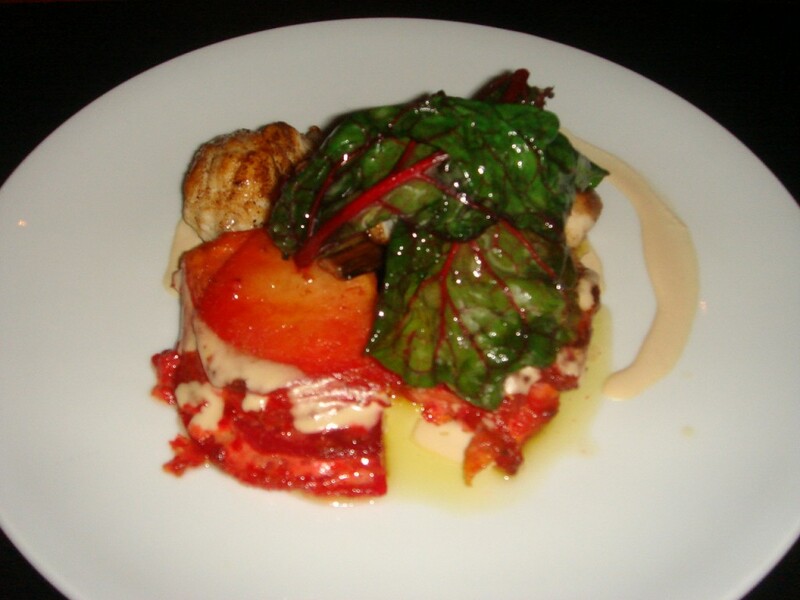 A main of roast monkfish, beetroot, celeriac and smoked anchovy gratin, braised rainbow chard and tahini lemon cream (£20.50) was wonderfully executed. The monkfish, nicely browned, was cooked perfectly, leaving it still moist. But the outright winner of this dish was the gratin. The beetroot, tender but still firm, moulded beautifully together with the cream. It wasn’t too sweet and packed lots of flavour. This was a delight to eat, and overall this was an excellent dish. 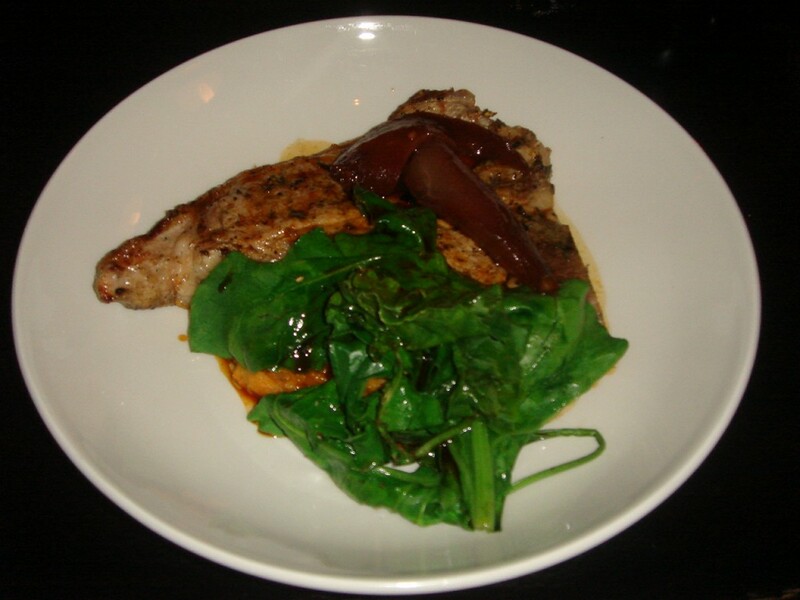 Grilled veal chop with sweet potato mash, sea beets and spiced poached pear (£19.50) was also highly enjoyable. The veal, served pink, was tender and juicy with lots of flavour, although it could have done with a little bit more browning for a crispier exterior. It was also a lot fattier that other veal chops that I’ve had at other restaurants, but nonetheless, it was very tasty. The sweet potato mash was smooth, flavoursome and creamy, and the pear, poached in cloves, cinnamon, star anise, and all spice bore the trademark touch of mulled wine. Extremely aromatic and fragrant, this had been nicely done. 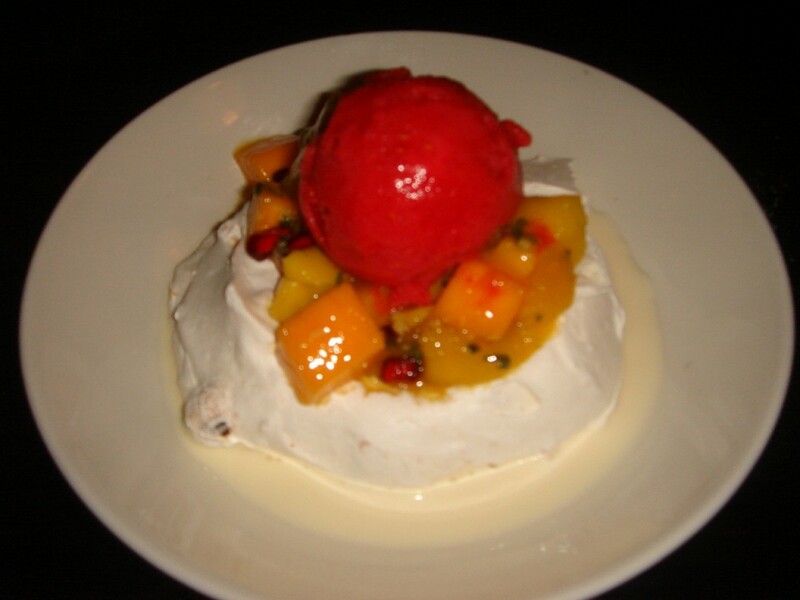 Dessert of hazelnut meringue, raspberry-rose guava sorbet and mango ginger salsa (£7) was superb. The firm meringue was accentuated by pieces of crunchy roasted hazelnuts which had been baked into it. The mango, sweet and firm, had been delicately kissed with finely cut pieces of ginger, Thai basil, chervil and lemongrass to create the salsa, the effect of which was astoundingly good. Aromatic from the herbs, there were little kicks of sharpness coming through from the ginger. The taste of the rose and the guava in the sorbet was clearly defined. Sweet but not too sweet, when combined with the salsa and the meringue, this dessert was a joy to eat. What was particularly memorable was how fresh and lovely the ingredients were. The natural goodness of their flavours shone through, and coupled with some skilful cooking and the deft use of herbs and spices it made for a lovely meal, even if the salad in the ricotta starter was a little bland. The service was good, although the ambience in the upstairs dining room did not quite match the downstairs area, as it was a little quiet. For a bit more atmosphere, request a table downstairs (it serves the same food as upstairs), but go. It’s definitely worth a visit. £26 to £36 for three courses. Excludes drinks and service. Fresh quality ingredients always make a difference! Sounds great! I have always wanted to go here sounds luke my type of food. I have heard there is a heavy providores influence in the cooking. Utter hell this one. Can’t believe you liked it. I liked it because I thought the food was good. Shame. Perhaps you had a bad experience. Smoked anchovy? That sounds worth a visit on it’s own. I have to say I’ve never really been tempted by this place (far too much sweet potato on the menu for my liking) but you’ve made it sound worth a visit. I absolutely adore the Modern Pantry. I’ve been numerous times and never been disappointed. Their Hokey Pokey ice cream is divine.